Enjoy wine country at home with our Estate Club. You are adding an Estate Club membership to your shopping cart. To finalize the purchase of this club you will be contacted by AVV via a phone call and/or email to confirm your credit card billing information. You may also call Mike Fishback at 707-433-7209 with the information. Our webstore does not store the credit card information you enter at checkout. 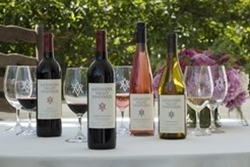 The club membership will not be active until Alexander Valley Vineyards has confirmed the billing information with you. Once activated you authorize Alexander Valley Vineyards to automatically charge your credit card for the monthly shipments. Shipments average $50 plus tax and shipping, however the March shipment of CYRUS will cost $117 plus tax and shipping. An annual membership is 12 monthly shipments, you may customize your membership by selecting up to 12 selections, with a minimum of six shipments per year. Please list your selection months in the note section at checkout.